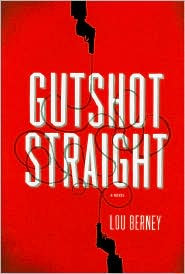 What a surprise to hear Lou Berney's interpretation of his debut novel, Gutshot Straight. He told the audience at the Velma Teague Library that it was a combination of Elmore Leonard's Get Shorty, with swindlers, set in the jungles of Panama. He asked if we all knew Walt Disney's version of Snow White. He said Gutshot Straight was his version of Snow White. What if Snow White was a con and a thief? In Gutshot Straight, Shake, just released from prison, is hired by the woman who heads the Armenian mob in L.A. to deliver a package to a man in Las Vegas. But, Shake discovers his "package" is a young woman who claims to be a housewife. Shake is actually a decent, nice guy, and he makes the decision to let the woman go. Suddenly, he's on the run to Panama with Gina, chased by the Armenian mob, and guys from Vegas. Lou said every time he felt the action slowed a little, he threw in another bad guy. He said his version of Snow White, Gutshot Straight, is not exactly Disney's version. It has humor, lots of twists and turns, but it's actually a love story between a man who doesn't trust anyone, and a woman who can't be trusted. Gutshot Straight is a poker term. It's a reckless gamble, a straight missing the middle card. And, Berney's book features people who are trying to change who they've been their entire life. They're trying to be good people after a lifetime of crime, a reckless gamble. In 2007, Lou Berney was writing screenplays for a living, and living in Oklahoma City. He also spent a great deal of his time mixing paint. Berney's father had Alzheimers, and stayed busy doing paint-by-number pictures. Lou said his father was amazing, fast and good, before he died. But the company that did paint-by-number pictures used to send about sixty little pots of paint. Now, they send six or twelve tubes of paint, and you have to mix it yourself. Lou's job was to mix the paint for his dad. He said his father was fast, and he was constantly behind in mixing, and he was always covered with paint. One cold day, his agent called and said there was good news and bad news. In Hollywood, that means there is bad news, and worse news. The bad news was the Writers Guild was on strike. The worst news was the two projects Berney had been working on were dead for that year. Lou said he lives in Oklahoma City, so he couldn't get together on the picket line with other writers and yell at executives in their SUVs. So, now he was stuck in Oklahoma City, in the cold weather, just mixing paints. Berney wrote a novel as his escape. He set the second half of Gutshot Straight in Panama, so he could go someplace warm and tropical in his mind, a place with good food and beaches. When people talking about reading to escape, he was an author writing to escape Oklahoma City in the dead of winter. His goal was to write a fun novel that had depth. Berney repeated that the main inspiration for his book was Snow White. Lou had two older sisters who babysat and kept him entertained with movies. When he saw Walt Disney's Snow White, it made two big impressions. First, he was deeply, powerfully attracted to the evil queen. Then, he thought, that huntsman is going to be in so much trouble for letting Snow White go. So, Shake is Berney's huntsman. He said it takes a special type of person to go from being one type of person, crooked, to another. Lou said there has to be consequences. Lou Berney said he used concrete information as parts of the book. He was interested in international marriage, the 21st century version of mail-order brides. Middle-aged men go on tours to foreign countries to bring home wives. It's a very lucrative business for those who run the businesses, but it's a little creepy, too. And, it became part of Gutshot Straight. Another element that became part of his book came from an experience he had while living in San Francisco. While taking BART, he met an older man, big, who looked ex-military. He turned out to be a retired cop from Texas, who had once worked as a bouncer in one of Jack Ruby's strip clubs in Dallas. The ex-cop said Dallas in the early 60s was like the Wild West. You could beat someone almost to death with bare hands outside a bar while off-duty cops cheered you on, and then bought you drinks. He said the man's eyes grew distant, and then he said, "Those were the days." Berney must have been an interesting boy. He included an episode from his childhood in his book, when a character was hit in the head by a full beer can thrown from six feet away. That happened to Lou when he was thirteen, and, even then, as he wobbled away, he thought, that was a heck of a throw. When Berney writes screenplays, he says they're 110 pages, and that's it. There's no room for anything except the characters and action. He's always cutting when he writes screenplays. William Faulkner said, "Kill your darlings," and that's no problem when writing screenplays. But, a novel is just the opposite. Berney said he likes a novel that sprawls and welcomes everyone in; the more the merrier. He said he writes his novels for himself, but when writing screenplays, he writes for producers, agents, and everyone else. That's not a healthy way to write, and that's why screenplays are all similar. But, you can be quirky in novels. He said screenplays are like political candidates. You can't afford to offend anybody, so they're all the same. It was fascinating to hear Lou Berney say the criminals in Gutshot Straight reflects his experiences. He worked restaurant kitchen jobs, and a whole circus full of criminals worked in the kitchens. Lou found it entertaining to work with ex-cons and reprobates. They had wonderful stories and personalities. He said at that time, restaurants hired anyone. If you could chop something up, you were hired. He said many of them were capable of being good people. They weren't so hard-boiled. When asked if he's done any fantasy film casting of the book, he said he didn't do that while writing. Shake and Gina were real people to him, and that's how he sees them. But, he said he could see Nathan Fillion, who appeared in Firefly, as Shake. He said Sienna Miller or Michelle Monaghan could be Gina. In answer to a question about a producer, he said he liked David Fincher, who directed Fight Club, but this wouldn't be his normal type of movie. He said Gutshot Straight is under negotiation, but he doesn't really think it's cinematic. It would have to cut, and some of his favorite characters would have to be cut from a film. Lou Berney thinks twenty-five years ago, Hollywood did a better job with movies aimed at adult audiences. He said now they make them for fourteen-year-olds. When it was mentioned that usually books are better than the movies, he said, there were some movies that were better - The Godfather, Jaws, but then he admitted those were done a while ago. But, now books are flattened out in the movies so they can reach the biggest audience, and not offend anyone. In Berney's opinion, TV does a better job than the movies now. When asked how he became a screenwriter, Lou said he published a book of literary short stories while in grad school. He went to the University of Massachusetts at Amherst. Then he moved to California and taught before he was accepted in a screenwriting program at Paramount. It's a program that doesn't exist anymore, but, at that time, if you'd published anything, you might get accepted into the program so you could learn the business. Students were paid one year's salary while in the program. Lou said he's recently worked on an adaptation of a book called Travel Writing that Rob Reiner is supposed to direct. And, he's worked on a musical family Christmas movie. He said for those jobs, he's paid up front, whether the movies are made or not. But, he has to make pitches to get the job, and you usually end up doing twice as much work before getting the job. He said sometimes the salary works out to minimum wage. He said if a studio hires him, and the movie isn't picked up, he gets paid, but not the big bucks he would get if it was picked up. He's written a script he likes, but his agent said it's not the right time for it. Right now, they want thrillers they can make for under $30 million. When asked if he's working on another novel, he said he is, but, first the ideas simmer. Then he takes notes, followed by an elaborate outline. Berney is working on two books, a sequel to Gutshot Straight, and a deeper, darker literary novel in the Kate Atkinson vein. When asked which screenplay he's proudest of, he said it was a one hour drama pilot for ABC with Jerry Bruckheimer's company. He said they were great people, and so generous. Although they're some of the most powerful people in Hollywood, they deferred to him when it came to the script. He loved the project about a junior faculty at a Southern university, and it was hard to let it go after spending six months on it. But, with the luck of the draw, ABC had a similar show and they went with that. He said although Bruckheimer's company wanted to try to sell it elsewhere, it was work for hire, and ABC owned it. They killed the project. Lou Berney summarized his debut novel, Gutshot Straight, as a fun, fast, romantic crime caper. It has action, thrills, and Panama. He said he expected Panama to be a big ditch, but it's a beautiful country, very cosmopolitan with beaches, a great history, and a beautiful city. Lou Berney appeared for Authors @ The Teague one day, and his book will be mentioned on the Today Show the next. Not bad for a debut novelist, and his terrific novel, Gutshot Straight. Gutshot Straight by Lou Berney. William Morrow, ©2010. ISBN 9780061766046 (hardcover), 294p. It's always interesting pulling for the bad guys (or the not-so-good guys) in a book, isn't it? Lesa, we're lying at the Mystery Kitchen this morning...in your honor! What an interesting event, Lesa. I'm going to mention Lou's book specifically to one guy in my mystery book group. He is a caper mystery lover and I think this will be right down his alley. Thanks for sharing! Great post, Lesa. You know, this is the second writer in two days who mention Nathan Fillion (and the great, great short-lived series, Firefly). Robert Crais mentioned him last night during his book stop. Lou Berney thinks twenty-five years ago, Hollywood did a better job with movies aimed at adult audiences. He said now they make them for fourteen-year-olds. I couldn't agree with him more, unfortunately. Anyways, this sounds like a very intriguing writer and book. Thanks for this. I thought that was an interesting viewpoint, too. And, I have to say when I read Gutshot Straight, I certainly didn't think of Snow White. It puts a whole new spin on the book. Just shows you the kind of imagination authors have, that I don't! I loved your lies over at Mystery Lovers Kitchen, but I don't know which ones are the truth! I know one of the librarians gave Gutshot Straight to a Carl Hiaasen lover, and he thought it was terrific. I'm waiting to see what Del on DorothyL thinks - another caper reader. Let me know if it works for the guy in your group. Lou did say, and he's right, the cover is going to put some women off. And, it shouldn't! Women will love it. Very interesting, Michael, that two people mentioned the same actor. And, you'd know about Lou's comments more than I do, because you follow movies more. It was a fun event, and he's an interesting author. Not at all a typical program. Once again you're right on the mark, Lesa. I had the delightful opportunity of catching Lou at Poisoned Pen last night. He's not only funny and entertaining, he's a terrific guy. Thank you, Jeff! I love to hear that I'm right on the mark. But, darn. I'm sorry I won't be at the Poisoned Pen tomorrow to meet you and Bob Morris. My loss.